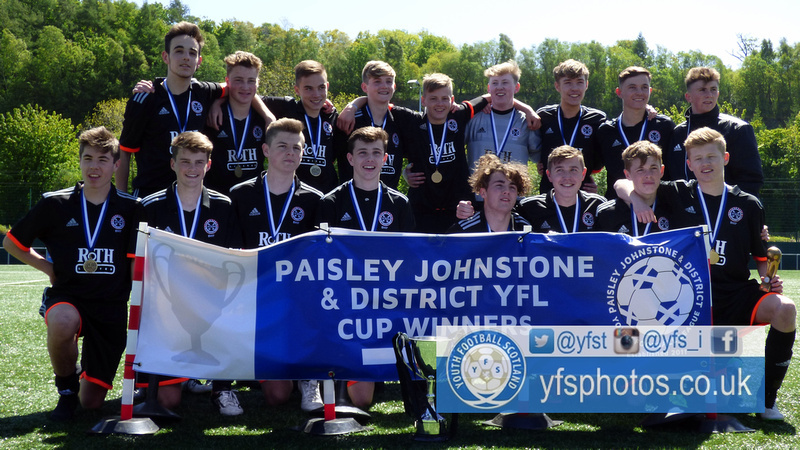 A wonderful, four-goal performance saw St Peter’s BC U16s win the Paisley Johnstone and District YFL Cup over Hillwood BC. Thomas Cruden opened the scoring just before half time and a further three goals would come in the second half to give St Peter’s a commanding win. The opening exchanges were tight with real chances few and far between, St Peter’s possibly looking the most likely to score. A good bit of play from Jay Little allowed Blair Grey to get in a cross for Cruden but his shot was eventually blocked and cleared. A couple of crosses from Little almost set up the opening goal for St Peter’s as his team were having a lot of joy from the wings. First, a cross met on the head by Steven Ferguson was well saved by Kyle Furphy. Another Little cross was again intended for the head of Ferguson but it was just over his head when any sort of contact would have most likely resulted in a goal. A corner by Lewis McCracken almost resulted in an unlikely goal for Hillwood as Josh Smith’s towering header went narrowly over the bar. Little again was causing lots of trouble from the wing. His cross this time was cleared only as far as Jack McWilliam whose shot was deflected narrowly wide. Again St Peter’s came forward this time through Louis Fisher. The battling midfielder fought to the by-line and his cross was flicked on at the front post by Cruden but his effort went barely over the bar. 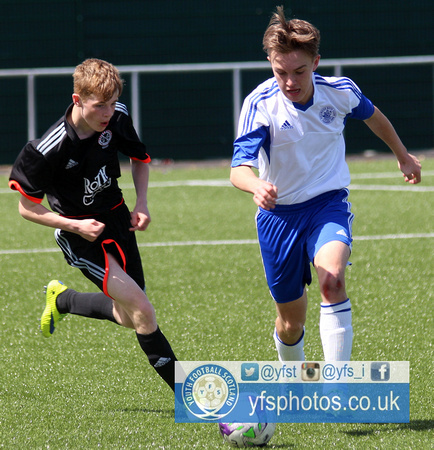 A couple of chances from Hillwood showed St Peter’s that they were still in this game. A long shot from Donaghy tested Ryan McLaren in goal but he was equal to it. Then a well-delivered corner by Ross Alexander was headed just wide by Chris Schneider. With a minute left on the clock St Peter’s finally found the breakthrough. Cruden was presented the ball at the edge of the box and after beating his man he made no mistake in firing a powerful shot past the helpless Furphy. Donaghy came painfully close to instantly levelling the score. His curling effort from the edge of the box went no more than an inch past the post. The second half started as tight as the first. Tempers started to flair as both teams felt the pressure of the cup being on the line. As the teams started to play football again, Hillwood were coming forward looking for the equaliser. A fizzing ball across the box found Kerr Watson all alone. When it looked inevitable he would score, McLaren came rushing from his goalline to block the shot and keep his team’s lead. As the hour mark passed St Peter’s doubled their lead. A lovely ball from Cruden played in Little who made no mistake when one-on-one with the goalkeeper. It seemed more a sense of relief than elation as St Peter’s grabbed the crucial second goal. There was only going to be one winner from here on out. Two minutes later the third goal would come to put the game beyond doubt. Hillwood were caught in possession at the edge of their own box by Fraser Burns. A nice one-two between Burns and Ross McKay resulted in Burns being brought down in the box for a penalty. It was an easy decision for the referee and Burns calmly finished from the spot. Late into the half St Peter’s would add a fourth to put some gloss on their impressive performance. Keiran Dyer was caught in possession by Bradley Rae who then had plenty of time to pick his spot and add his name to the scoresheet. As time ticked by St Peter’s had a few more chances to add a fifth. The air clearly completely out of Hillwood as their efforts looked to be in vain in a battling match. The match ended and St Peter’s were able to get their hands on the cup. The quality of passing and retention of possession by their midfield being the difference between the two teams on the day. Josh Smith - Fought all day as he had a thankless task to try and keep out St Peter's wingers. Jay Little - Probably just nicks it from Josh Cruden as he was a constant menace all day down both flanks. An excellent save by Kyle Furphy to deny Steven Ferguson. The second goal by Jay Little was a lovely move and really sent St Peter's on their way to the cup.